Kozhukattai (கொழுக்கட்டை) is a special delicacy made on ‘Vinayaka chathurthi’ (விநாயக சதுர்த்தி) day, though some make it on other auspicious days as well. It is nothing but rice flour dumpling made with different types of fillings. Traditionally, kozhukattai is prepared in a rather elaborate method. However, nowadays with the availability of ready-to-use rice flour, the preparation of this snack has become simpler. Kozhukattai can be made with fillings such as sweet coconut mix (தேங்காய் பூரணம்), spicy urad dhal paste (உளுத்தம் பூரணம்), sesame seeds mix (எள் பூரணம்) and sweet dhal mix (பருப்பு பூரணம்). Of these, most popular ones are sweet coconut and spicy urad dhal fillings. Kozhukattai is a tasty and rich snack. Following recipe works well for me. Why don’t you give it a try? *Buy any brand of kozhukattai flour available in the shops. How to prepare sweet coconut filling: Grate the white meat of coconut finely. Alternatively, you may cut the white meat into smaller pieces and grind in the mixer using the whipper option. Remove cardamom seeds and powder them finely. Keep aside. Heat powdered jaggery with ¼ teacup (50ml) of water in a kadai. Stir occasionally till jaggery is dissolved fully. Switch off the stove and filter through a sieve to remove impurities. Now heat the filtered jaggery solution in the kadai and bring it to boil. Add the grated coconut and cardamom powder. Mix well and cook on low flame till the water is fully absorbed and the contents start to separate from the sides of the kadai (Fig.1). Switch off the stove and allow it to cool. How to make spicy dhal filling: Wash and soak urad dhal and channa dhal in sufficient water 2 hours. Later drain the water, wash once again and drain fully. Grind the dhal with green chillies, salt and asafoetida into a coarse paste. Steam the paste for 10 minutes in a pressure cooker or a kitchen steamer. Let it cool and later, crumble it with your hands. Heat oil in a kadai, add mustard seeds and when they start to sputter, add the crumbled dhal paste. Saute for 2-3 minutes on low flame. Garnish with curry leaves (Fig.3). Keep aside. How to prepare the kozhukattai covering – Traditional method: Wash and soak raw rice for 4-5 hours. Drain fully, spread on a clean cloth and dry in the shade overnight. Next morning finely powder the rice using the mixer-grinder. Pass through a fine sieve to remove any larger particles. Traditionally, this freshly made flour is used for making kozhukattai. Short-cut method: You may use the ‘kozhukattai’ flour available in the market. Mix rice flour and salt with the specified quantity of water to form a thick paste. Add in gingelly oil and mix well. Heat this mixture on medium flame stirring continuously till the paste thickens and separates from the sides (Fig.5). Switch off the fire. Cover and keep aside. 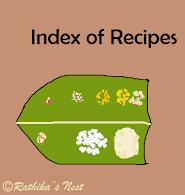 Note: While making kozhukattai, always keep the remaining flour paste covered, lest it will dry up and you will find it difficult to spread the paste. How to make kozhukattai: Smear your palms with gingelly oil. Take a lemon sized ball of rice paste and flatten it into a circle of around 4” diameter. Place a large gooseberry sized ball of coconut filling in the center (Fig.6). Bring the edges of the covering on top of the coconut filling and press the edges together. You may use a kozhukattai mould to shape the kozhukattai (Fig.7). Repeat the process till the coconut filling is fully used up. Take a large lemon sized ball of rice paste and flatten it into a circle of around 5” diameter. Place 2 teaspoons of dhal filling on one half of the circle. Bring the other half over to cover the filling and seal the edges by pressing them together. Use a different mould such as ‘somas mould’ to shape kozhukattai (Fig.8). This way you would be able to differentiate sweet and spicy varieties after steaming. Repeat the process till you use up both rice flour paste and spicy dhal filling. Smear oil on steaming trays of either idly or idiappam mould; arrange the kozhukattais on the trays (Fig.9). Steam for 7-10 minutes using a pressure cooker or idly cooker. Switch off the stove, remove from the cooker and serve hot.